Two years ago I made this quilt for my college roomie, Melissa. I sent it off to her as a birthday/thanks-for-being-an-awesome-friend gift, and she was so excited to receive it! Then last year she took a trip to Ethiopia with her parents, and while she was gone her car was stolen. Just before she returned the police found her car, but all of her possessions in the car were gone. In their place she had "inherited" a pair of neon-colored Nikes. 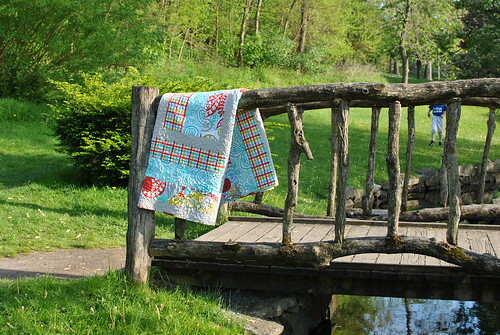 Among the things she lost in the car was her quilt. I knew about her car, but I didn't realize her quilt was involved until last fall when I met up with her and she told me the whole story. She was so upset about the quilt, and I wanted to try to replace it. 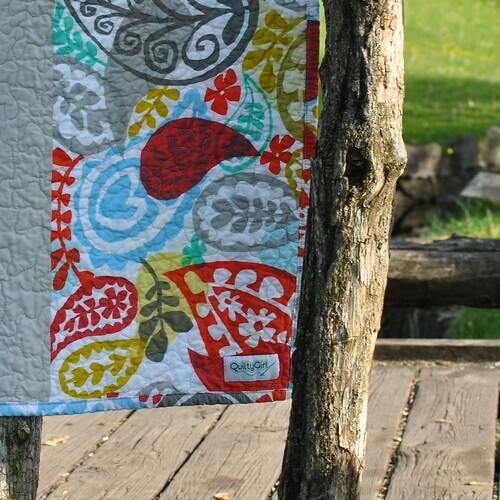 At the time that I made her first quilt, the fabrics were pretty hard to find. I stumbled upon them in a shop in Chicagoland when I was visiting my family, and felt lucky to happen upon them then. I wasn't sure if I could find the same prints again, but I wanted to try! So in January when we were visiting family, I asked my mom to take me over to the quilt shop. With fingers crossed, I ventured into the shop, and found the fabric!! It was in the same spot that I first found it, with plenty of yardage left to buy. I bought enough to recreate Melissa's quilt, and a little extra for me, of course. Thanks to my blog pictures and description, I was able to recreate the quilt pretty close to the original - including the pieced back! I was so excited to send this off, and by some miracle the quilt made it all the way from NY to CA in TWO days! Melissa texted me as soon as she received it to say a huge thanks-which was the very best part, for me. Don't forget to hop over here to enter the giveaway on my blog!